and Post Office Workers Online Supply Catalog. 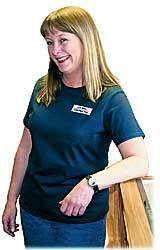 We specialize in United States Postal Service clothing and accessories. We offer casual clothing, signs, equipment, and supplies for rural mail carriers, contract carriers, postal workers, and postmasters. Our letter carrier clothing line includes jackets, T-Shirts, sweatshirts, shirts (including denim shirts), shorts, caps, and visors. We offer patches with US Mail, United States Postal Service, and other USPS logos. Ken-Den has a complete inventory of equipment and supplies for rural carriers and post office workers. Outfit your vehicle with our magnetic, static cling, and nonmagnetic vinyl signs. We have signs with a removable pouch, door protectors, and suction cup window signs. Stay safe with our magnetic mount double flash strobe light, halogen lightbar, or single flash strobe. Use our handy mail hawk to service hard-to-reach mail boxes without leaving your vehicle. We have postal package markers, delivery confirmation markers, rural carrier labels, and heavy duty tie-out straps. Ken-Den Rural Carrier Supply provides prompt service to meet the needs of U.S. Postal Service carriers and workers.